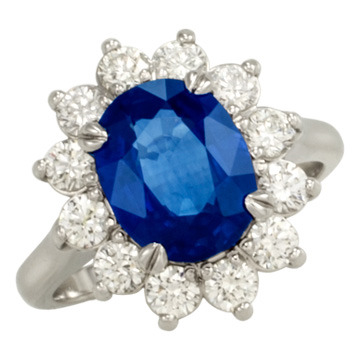 This blue sapphire and diamond ring is both stunning & classic. Make a statement with this extraordinary 3.06 carat oval shaped sapphire surrounded by almost a carat of brilliant cut diamonds. This ring is perfect as a princess diana inspired engagement ring, or an everyday fashion ring.